The CIA World Factbook rates Swaziland's telecommunications system of "some modern, but not advanced. It consists of open-wire lines and low-capacity microwave radio relay. Swaziland has one satellite earth station. 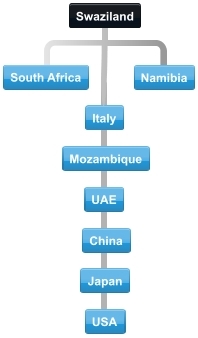 According to Budde.com.au, Swaziland is one of the world's last countries to move away from state-own monopolies in the telecommunications market. SPTC served as the sole operator and the telecommunications regulator until 2011. It also had a partnership with MTN, the only mobile network operator at the time. SPTC was restructured in 2014 and charged with maintaining and operating the national telecommunications backbone infrastructure. The business side is now operated by a subsidiary of SPTC. In 2014, a second mobile operator, Vettel, placed a bid for a mobile telephony license to enter Swaziland's market as Swavitel. Thus far, the only telecommunications sector in Swaziland to have any real competition is the Internet sector, which has four ISPs. In 2014, Swaziland had 337,300 Internet users, which is almost 24 percent of the population. Despite the competition, Internet pricing remains high. Because Swaziland is landlocked, it relies on its neighbors for international bandwidth. This combined with a limited fixed-line infrastructure have hampered Swaziland's Internet potential. However, there are some bright spots including new access to fiber optic submarine cables and the arrival of 3G mobile broadband services several years ago. The Kingdom of Swaziland is located in South East Africa next to Mozambique and South Africa. 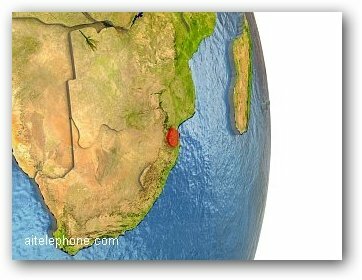 Swaziland is one of the smallest countries in Africa, measuring just 120 miles by 81 miles (6,704 square miles). Swaziland was a British protectorate from 1903 through 1968 when it finally its independence from the British. Swaziland is an absolute monarchy ruled by King Mswati III. The king has allowed the country to become more democratic, with a constitution finally arriving in 2006. However, the political parties' legal status was not clearly defined and remains unclear today. 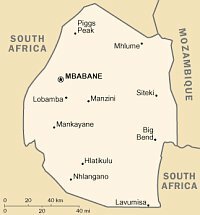 Swaziland has a population of 1,435,613. The country has the highest known HIV/AIDS prevalence rate in the world. Thus, it also has lower life expectancy, higher death rates, higher infant mortality rates, and lower population rates than what would have otherwise been expected. Swaziland's economy is diverse with various sectors such as agriculture, forestry, mining, manufacturing, and government services. Worker remittances from South Africa also play a role in Swaziland's economy. Most of Swaziland's high value crops are grown on Title Deed Lands which receive a great deal of investment and irrigation. However, most of Swaziland's population, roughly 75 percent, relies upon subsistence agriculture on Swazi Nation Land, which does not receive the same level of investment. This low productivity by the vast majority counters the higher productivity of Swaziland's more robust sectors. In addition, Swaziland has a large income distribution gap that reflects the Pareto principle (the 80/20 rule). Roughly 20 percent of Swaziland's population controls about 80 percent of the country's wealth. Due to its proximity to South Africa, Swaziland imports more than 90 percent of its goods from South Africa. It also aligns its currency to the South African rand. Swaziland has a high unemployment rate of about 40 percent, and more than 25 percent of the adult population in Swaziland is infected by HIV/AIDS. Other challenges include drought and flooding, soil depletion, and overgrazing. If you are in Swaziland and would like to place an international phone call, you'll need to dial Swaziland's exit code of 00 first followed by the international country code of the other party. Once dialed, you can then dial the phone number. Similarly, if you're in another country and would like to place an international phone call to someone in Swaziland, you'll need to dial your country's exit code first followed by Swaziland's international country code of 268 before dialing the phone number. Use the Connect app - This free app takes care of joining you to the international conference bridge, whether you're in Swaziland or another country. Not only will it route you over a high quality PSTN network, it does so using our competitive dial out rates. It also lets you record your calls or join attendees manually. Use the included dial-out feature and add your guests to the call located in Swaziland. Use operator assistance - Our live US-based operators can join you and your attendees to your Swaziland global conference calls 24/7. Whether you're in Swaziland or any other country, our pay-as-you-go international conferencing plan is easy and affordable. There are no contracts, no monthly fees, and no commitment. Antigua, Argentina, Australia, Austria, Bahamas, Bahrain, Barbados, Belarus, Belgium, Bermuda, Brazil, British Virgin Islands, Canada, Chile, China, Colombia, Costa Rica, Cyprus, Czech Republic, Denmark, Dominican Republic, Ecuador, Egypt, El Salvador, Finland, France, Germany, Greece, Hong Kong, Hungary, India, Indonesia, Ireland, Israel, Italy, Jamaica, Japan, Korea, Luxembourg, Malaysia, Mexico, Montserrat, Netherlands, New Zealand, Norway, Panama, Poland, Portugal, Puerto Rico, Russia, Saudi Arabia, Slovakia, Slovenia, Singapore, South Africa, Somalia, Spain, St. Kitts/Nevis, St. Lucia, St. Vincent, Swaziland, Sweden, Switzerland, Taiwan, Tajikistan, Thailand, Trinidad, Tobago, Turkey, UAE, UK, Uruguay, Uzbekistan and Venezuela. As an example, your office in Swaziland can host a conference call with participants located in South Africa, UAE, China, Italy the US and any other country. Join with your associates located in Swaziland on international conference calls. Attendees located in Swaziland can use the free included Connect App with their smartphone or desktop to access the conference call without dialing an access number. Optionally the chairperson can connect anyone to the call in Swaziland using the included dial-out feature.